★ Preheat oven to 180C/gas 4. Place the raisins and rum in a small saucepan over medium heat. Cook, stirring occasionally, for 8-10 minutes or until the liquid has been absorbed. Mash roughly with a fork and set aside. Place the chocolate and butter in a medium saucepan over low heat and stir until melted and smooth. Remove from the heat and place in a large bowl. Add the sugar, eggs, flour, baking powder and cocoa and whisk well to combine. Add the raisin mixture and whisk well to combine. Pour the mixture into a lightly greased 24cm x 34cm slice tin or equivalent traybake tin lined with nonstick baking paper. Cook for 20-22 minutes or until cooked when tested with a skewer. Allow to cool completely in the tin. ★ Using a 9cm tree-shaped cutter, cut out 10 trees. To make the icing, place the sugar and water in a small bowl and mix to combine. Place in a piping bag and pipe the icing on to the trees. 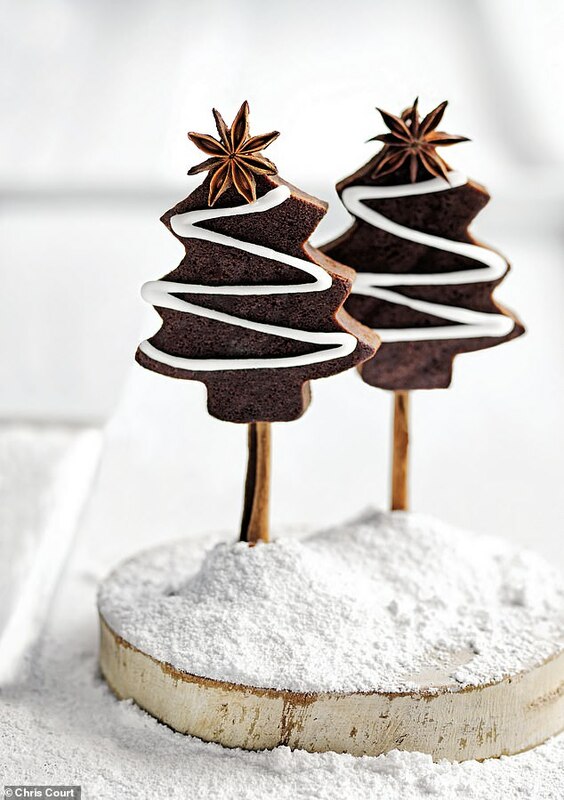 Decorate with cinnamon and star anise to serve. NOTE Remove the cinnamon and star anise before eating.